May 19, 2011 – India’s cabinet has approved a proposal for a survey to identify people living below the poverty line, which also redefines what constitutes poverty. It will classify the rural poor into “destitutes, manual scavengers and primitive tribal groups”. Officially, 37% of India’s 1.21bn people live below the poverty line. But one estimate suggests this figure could be as high as 77%. AN ALTERNATIVE TO CONVENTIONAL PUBLIC WATER SERVICE : “USER GROUP NETWORKS” IN A MUMBAI SLUM, 2011. Rémi de BERCEGOL, Adeline DESFEUX. Centre for Human Sciences. Providing universal access to drinking water remains a formidable challenge in the cities of developing countries and all potential technical and institutional solutions need to be taken into account. 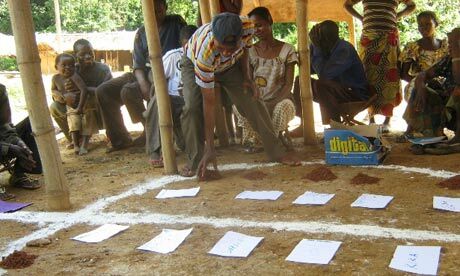 By looking at the specific example of “user group networks” set up in a poor neighbourhood in the North-East of Mumbai, this article aims to highlight the ability of local communities to design and run functional systems that compensate for shortcomings in the public service. We will analyse the effective role that users play in regulating these groups at local level as well as the political-territorial implications of this type of management. After providing a clear overview of the systems that have emerged and their modus operandi, we will describe and assess them from a critical technical/economic perspective in order to suggest possible improvements. More generally, our research is part of a broader attempt to study the different ways of providing access to urban water and the legitimacy of local communities in taking the process in hand. We wish to contribute to the debate that focuses on providing a differentiated service to the inhabitants of the same city. April 22, 2011 – While other industrial designers merely tweak the appearance of the latest electronic gadget to make minor improvements to trivial point-of-sale appeal, Israel’s Noa Lerner, a Berlin-based industrial engineer, is developing a much more crucial necessity: a mobile public toilet for third world urban slum dwellers. Lerner was struck by the existence of the problem on a trip to India, finding that even the centers of large cities had no public toilets. It is even worse in slums, where no sewage system exists. 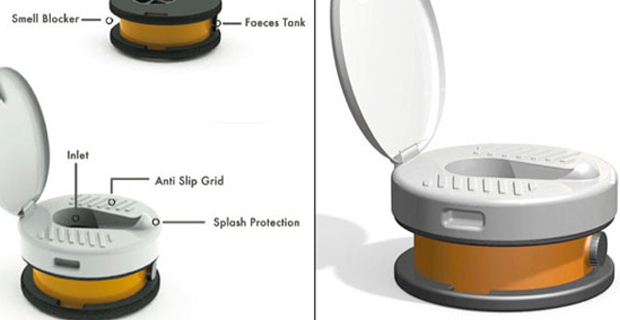 The design that she created at her company Morph Design, involves a top that resembles the familiar toilet bowl, placed over a removable container covered with a plastic layer with odor-repellant and anti-bacterial substances. A very small amount of water is used to rinse the top bowl. These nearly waterless green toilets could be emptied like chamber pots, but with a difference. About once a week, these could be rolled (securely closed of course!) to a neighborhood collection facility. Each of these toilet barrels is sealed and nano-coated in a way that allows them to be used for a week at a time without emptying or cleaning. Once it’s time to empty, the barrel is brought by an individual or a multi-barrel servce to the local Biogas Plant. Once there, waste is traded for energy in the form of cooking gas, warm water for showers, or electricity. All of these forms of energy are generated by processing the human waste at the Biogas Plant. Once the contents collected at a neighborhood facility, where the secretions could be farmed to create methane gas through composting, which can then be used as an energy source or fertilizer. Working with the Indian non-profit: Sulabh, which is already operating various ways of serving the needs of slum dwellers in India, Lerner will create a pilot project to be launched in India’s capital. The environmental problems confronting Indian cities today have arisen because millions of people have been forced to live in illegal settlements that lack adequate sanitation and other basic urban services. This is the result of two factors. The first is the legacy of the colonial city characterized by inequitable access to sanitation services, a failure to manage urban growth and the proliferation of slums, and the inadequate funding of urban governments. The second is the nature of the post-colonial state, which, instead of being an instrument for socioeconomic change, has been dominated by coalitions of interests accommodated by the use of public funds to provide private goods. This has enabled the middle class to monopolize what sanitation services the state has provided because the urban poor, despite their political participation, have not been able to exert sufficient pressure to force governments to effectively implement policies designed to improve their living conditions. The consequence is that public health and environmental policies have frequently become exercises in crisis intervention rather than preventive measures that benefit the health and well-being of the whole urban population.